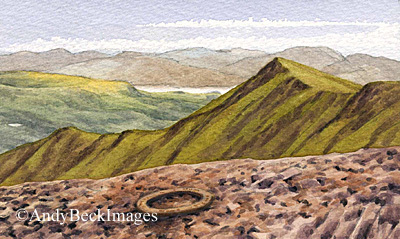 Blencathra trig ring- now gone. Obviously when researching the references for The Wainwrights in Colour book I could only record the elements of the sketch as they were on my visit. As the whole project took ten years to complete there will have been changes to some of the scenes even since my work let alone in the intervening years after AW’s visit. One of the locations which have stuck in my mind was the Ordnance Survey Triangulation Station on the top of Hall’s Fell on Blencathra. Readers of The Wainwrights in Colour book (page 211) will have noted the explanation of why Wainwright did not mention or illustrate this concrete ring on his visits in the early 1960’s even though it had been in place since at least 1953, the marker was underneath the small cairn which was in place at the time which has since been removed and hence revealed the feature to the rest of us. There are only two of these concrete rings on the 214 Wainwright fells, here and on Branstree. There are a few others at different locations. Sadly it was revealed recently on social media that this concrete ring has now been removed after being in place for over 65 years. With a diameter of about 18 inches it would have not only been quite heavy but also I would imagine quite fragile, within the concrete was a metal ring of Phosphor-bronze used to locate the ring if it was buried. The metal ring would hardly have been worth taking on its own. How anyone could have thought that they could have extracted the ring intact and then lugged it down off the hill un-noticed as a keepsake is beyond comprehension. My guess is that it was prised out of place and then thrown over the edge of the ridge as a prank, perhaps there is someone with the intention of removing all such features from the fells- not long ago the tall cairn on nearby Carrock Fell was dismantled. What possibly made the task easier for the culprits was the fact that in mid-July 2018 a walker/ trig hunter cleaned out the very centre of the ring of the years of compacted dirt and stone chippings to reveal the bolt for th first time for ages. In doing so he also exposed the underside of the concrete ring, making it easier to lift. I am sure that this was totally unintentional but it may go some way to explain why the ring has gone now. But should we be that worried? The trig point had served its purpose all those years ago in the surveying of the country, the O.S. has no need for it now, nor have they shown any interest in replacing the ring. GPS provides a more accurate method of surveying. What if the ring was replaced and has been suggested? Well, this would ony be a replica of course and not the genuine historic feature, would it be even more of a target for vandals/collectors? Is there something to be said for removing all such man made markers of the hills and if so where do you stop? Many cairns have historic value, being formed from ancient curricks or tumuli. Even though it didnt go back to the long past the concrete ring at the top of Hall’s Fell did identify the summit of Blencathra which can be confusing in poor weather. Perhaps we should leave it as it is and move on or is there a case for putting in place a replacement feature such as the viewpoint marker columns such as those that can be found on nearby Skiddaw or Catbells. I have yet to make my mind up but whatever happens my next painting of Blencathra summit will be without the concrete ring.